The holidays are here, and you know what that means? Visions of sugarplums are sure to be dancing in your children’s heads as they await all of the yummy seasonal treats. But, did you know there are some stocking stuffers that you can give your kids to help them take care of their teeth? Keep reading to learn 7 fun and healthy stocking stuffers to make sure your children get through the holiday season in good oral health. Your kids may not be excited about a new toothbrush like you are, but you can pick a fun electric one with a theme they enjoy. Some brushes play songs or have your kid’s favorite movie characters on them for a fun brushing routine. Thanks to a competitive market, there are a ton of new and fun toothpaste flavors that you can give your kids to make them like brushing better. There are fruit flavors, but there’s also chocolate and even bacon flavored toothpaste. Just make sure whatever toothpaste you choose has an American Dental Association (ADA) seal on it. It’s the little things that can get your kids to brush more. Change out your ordinary cup for a fun princess or super hero toothbrush holder. There’s a holder out there for whatever your children are interested in, so take advantage and stuff their stockings with something to help their oral health. Brushing the correct amount of time can be difficult, especially for kids. So, let Santa gift them with a fun tooth timer that will make sure they’re brushing 2 minutes each session. You can switch up your child’s bedtime story with one that promotes good oral healthcare. Books like these can make understanding the importance of brushing and flossing fun. Even if your son or daughter doesn’t have a phone yet, you can download one of many dental apps to educate your kids in a fun and interesting way. There’s even an app called Brush DJ, where you can turn brushing into a party by playing energetic, 2-minute songs. If your kids play sports, a mouthguard is a must. Even in sports like baseball and basketball, injuries like chips and cracks can occur, so you should make sure that your children have the proper protection for their extracurriculars. Making brushing and flossing fun can be a real difference maker in your son or daughter’s oral health. Use these creative stocking stuffers to keep your children on top of their teeth cleaning routine during this season of sugar. 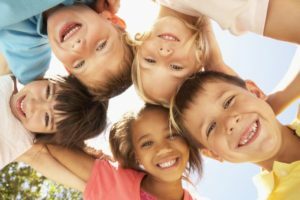 At Brush Pediatric Dentistry, we have a team of 3 dentists who are dedicated to caring for kids’ teeth. Drs. Mira Albert and Lynna Gripentrog are board certified pediatric dentists, so they’ve undergone extensive training and education to provide your children with high-quality care. For any questions, they can be contacted through their website or by phone at (630) 504-2223.